Referee Ben Nunoo Mensah stopped the bout two minutes into round seven of the scheduled twelve on the advice of the ringside doctor following excessive bleeding by the Ghanaian from a cut suffered in round 3. Kareem who had called the bluff of home favourite Johnson in the build-up to the fight, the main event of the ‘Night of Rivalry’ boxing extravaganza under the auspices of the Tony Kermah run Landmark Promotions and Management, lived up to his word by opening the cut on his opponent early on which proved decisive in the victory. “I said it that this fight will not go beyond round 8 and here it is I did it, I didn’t have any problem at all. I said it all along that he is not strong enough for me. “I thank God and I thank my manager and promoter who is my godfather Anthony Kermah also known as Papa for everything. I am so grateful and happy,” Kareem answered Ghana’s number one ringside announcer Mohammed Amin Lamptey right in the ring at the Lebanon House minutes after his decoration. Landmark Promotions CEO Anthony Kermah expressed his appreciation to all for making the event a memorable night despite the slight rain which drizzled across Accra all night long. “It’s been a very great night of good boxing and we are grateful to everyone who came to support us despite the rain. I saw it as showers of blessing and the sign of good things to come for Landmark Promotions and our stable of fighters,” Mr. Kermah told SportsInGhana.com. 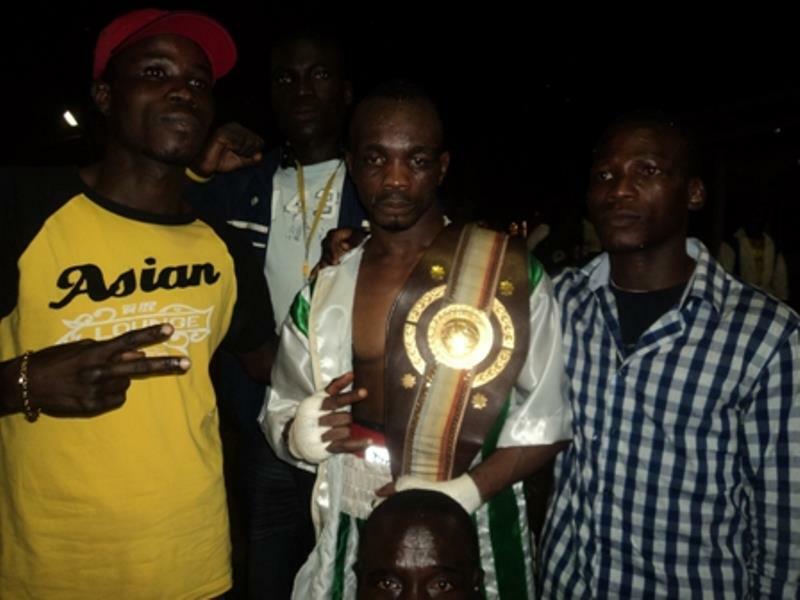 In other fights on the night, Sena Agbeko scored a 2nd round stoppage win over Anyetei Sowah in their Super Middleweight contest whilst Ben Ansah AKA One Bullet scored a unanimous points decision win over Samuel Turkson alias Python in their all-Chorkor Lightweight clash which lived up to the hype as set of fans of both fighters enchanted with their support all fight long. Hot prospect Frederick Lawson AKA Okunka once again made his case for a big fight after claiming a decisive round one knock out win against Nigerian Adebisi.